I'm Here. I'm Queer. What the Hell do I read? : Mitt Romney was a High School Bully... Does It Matter? Mitt Romney was a High School Bully... Does It Matter? A fancy private high school, where the students wear ties and carry briefcases, and live in dorms. Every guy has their hair cut short. Everyone looks pretty much alike. A new student, John Lauber, has bleached blonde hair, and wears it long - covering one eye. Others make fun of the new guy, teasing him for the hair and what the hair might mean... that the new kid is gay. "...Friedemann entered Stevens Hall off the school’s collegiate quad to find Romney marching out of his own room ahead of a prep school posse shouting about their plan to cut Lauber’s hair. Friedemann followed them to a nearby room where they came upon Lauber, tackled him and pinned him to the ground. As Lauber, his eyes filling with tears, screamed for help, Romney repeatedly clipped his hair with a pair of scissors." Okay, this homophobic attack (as reported in the Washington Post) happened back in 1965 - I wasn't even born yet. Forty-seven years before Mitt Romney is running for President of the United States of America. Should it matter? "...honorable men don’t chuckle at cruelty." "Targeting the vulnerable is an act of cowardice. The only way to vanquish cowardice is to brandish courage. Romney refused to do so." "Americans want to know that the boy from that prep school grew up in knowledge and wisdom and grew deep in compassion and empathy. We want to know that his shoulders are now wide enough to bear blame and his heart is big enough to seek contrition." 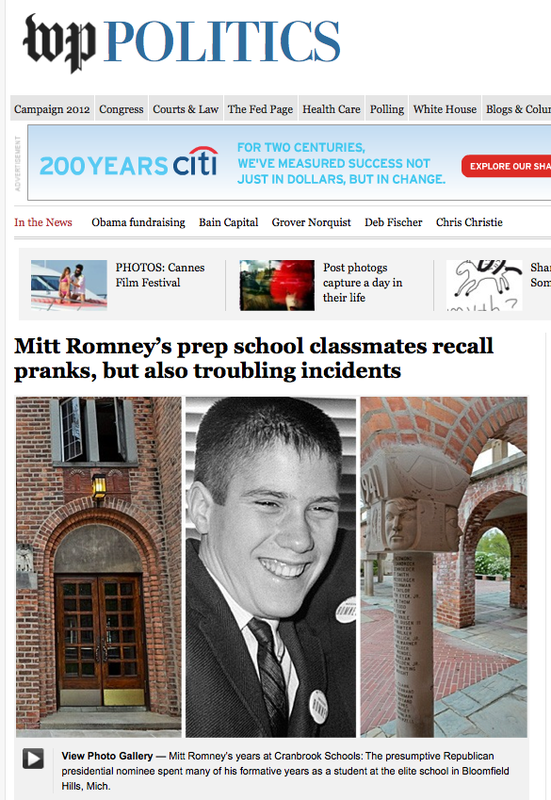 Instead, what Romney did was laugh about it, say he didn't remember the incident, and failed to express regret or show he'd learned anything in the forty-seven years since he viciously attacked a classmate for being "different." He missed what might have been a transformative, teachable moment that addressed the epidemic of bullying today. Mitt Romney was a High School Bully. Romney's behavior as a teen could have been excused if a) he had expressed a real sense of regret for his actions and b) he weren't arguing against gay rights to this day. As it is, I can only assume that he doesn't take this kind of bullying seriously, either in the schoolyard or on a national level. The idea that Romney physically acted against another human being and doesn't even remember it creeps me out. The act paired with the convenient memory loss say quite a bit about him. If he regretted his actions, it would be entirely different. Honestly, I was a cold jerk in high school and would HATE to be judged now by my actions/poor decisions of that era. So, my first reaction to this story was just another example of overblown election year ridiculousness. But then I realized that the real problem is that he hasn't changed much. He grew up and took a job that forced small companies out of business and put people out of work. He's against almost every program and institution we have in this country to protect people from high corporate corruption and bullying (anti-union, anti-safety nets, anti-taxes-for-the-wealthy, etc.). He supports policies that are anti-woman, anti-gay, anti-minority... he even treats his dog like luggage and thinks it's an amusing anecdote. The fact that he was a bully in high school doesn't concern me. That fact that he's STILL a bully concerns me greatly. Anyone who is surprised by this story, or thinks it tells us anything new about Romney, just hasn't been paying attention. Romney's callousness is evident almost every time he opens his mouth. He has no empathy, no apparent ability to understand what life is like for anyone other than Mitt Romney. An act of prep school violence is relevant to the people who suffered and witnessed it. But his overall lack of empathy, his overall cruelty, is relevant in a larger sense because it is embodied in his approach to public policy. Another vote for it mattering. As others have said, it's not so much what he did as a teenager that's the problem, as it is how he reacted now to being asked about it. I have a hard time with the idea that he doesn't remember that -- seriously? [eyeroll] -- but even if he didn't, the fact that he laughed about it tells us what kind of person he is now. I don't want that person as my president. Only The Ring Finger Knows - Gay Teen Manga! International Family Equality Day is May 6th!